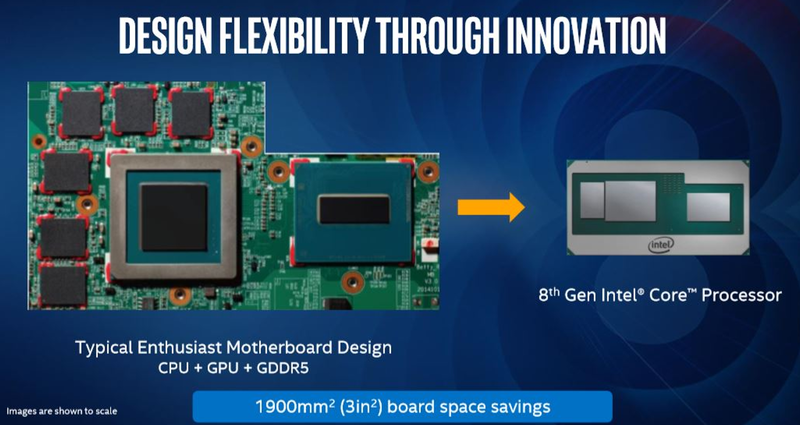 Back in November Intel finally ended months of speculations and rumors when they announced their plan to incorporate AMD graphics processors into their high-performance mobile solutions. CES 2018 is just getting underway and we already have interesting announcements from Intel. In addition to the expected standard Coffee Lake models that should be announced soon, Intel has finally launched 8th generation Core processors with Raxeon RX Vega graphics. We should start off by noting that those are in fact Kaby Lake “8th Gen Core” parts and not Coffee Lake. In other words, the CPU die used in those processors is identical to the one used for the Kaby Lake H parts. The simplest explanation for that is that those parts were originally planned on being launched before Coffee Lake. However, competition from AMD had forced them to shift the Coffee Lake launch forward. You will notice that Intel has gone to great lengths to hide the fact that this is Kaby Lake and not Coffee Lake by only referring to their CPUs as “8th Gen Core” only. Those new processors make use of a relatively powerful graphics processor based on AMD’s Vega microarchitecture. Intel has stated those parts are custom design. The reason for this is likely the interface – an EMIB. 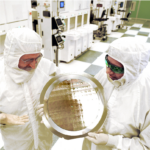 EMIB requires that the dies use much smaller micro-bumps than your typical die bumps in order to be able to pack the dies more closely together. As with the normal H-series and desktop parts, the Intel processor features 16 general-purpose PCIe lanes. 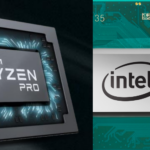 However, since the GPU is permanently installed into the same package, 8 of the PCIe lanes are also permanently taken for direct communication between the Intel microprocessor and the AMD graphics processor. This leaves 8 other PCIe lanes for all other peripherals. In claims that going from a typical enthusiast motherboard where the parts are spread to this single-package solution, there is a substantial space saving of 1,900 mm² (3 in²). Note that in the slide above, it does indeed say “Images are shown to scale” so that should give you a good idea of the kind of saving being talked about. 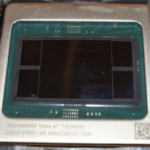 All parts also incorporate 4 GiB of high-bandwidth memory. We are probably looking at something like the 5mKGSD configuration which means 4 dies + a base logic die. This memory is 1,024-bit wide with a rate of 1.6 Gbps, meaning a maximum bandwidth of 204 GB/s. Intel claims that the use of HBM 2 here mean up to 80% less power than similar GDDR5 solutions. Five parts have been announced. They are all branded as Core i7 and Core i5 parts and have a “G” (likely for Graphics) suffix. The parts are shown below (you can also find a complete table here). Some clarification about the specs is needed. First of all, yes this Core i5 does indeed have hyperthreading. Intel introduced hyperthreading for Core i5s quad-core configuration with with the introduction of Kaby Lake R back in August 2017. 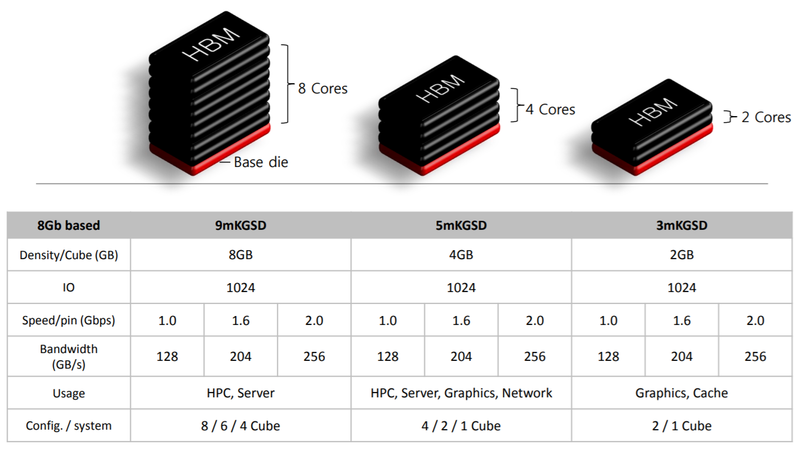 Therefore all models have almost identical specs: 4 cores, 8 threads, with all the technologies (i.e., everything up to AVX2). 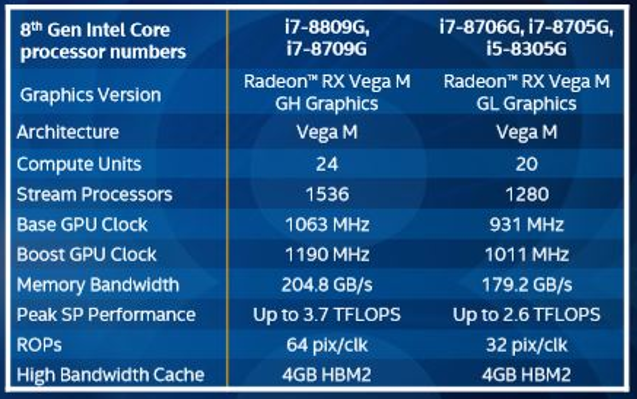 Note that the i7-8706G is identical to the i7-8705G except for the fact that the 8706G is the only SKU with vPro technology enabled. It’s worth noting that the i7-8809G is the only unlocked part, allowing overclocking for the CPU, GPU, and the HBM clocks. Every one of those processors still incorporate Intel’s HD Graphics 630, the GT2 (Graphics Tier 2) integrated GPU found on all standard Kaby Lake processors. But this is a truly new class of products because in addition to this integrated GPU, those processors feature a custom Radeon RX Vega M graphics processor. There are two models “GL” and “GH”. The GL version is found in the 65 W parts while the GH version is found in the 100 W parts. Additionally, the 65 W parts are paired with the 700 MHz HBM2 which has a bandwidth of 179 GB/s while the 100 W parts are paired with the 800 MHz with a bandwidth of 204 GB/s. 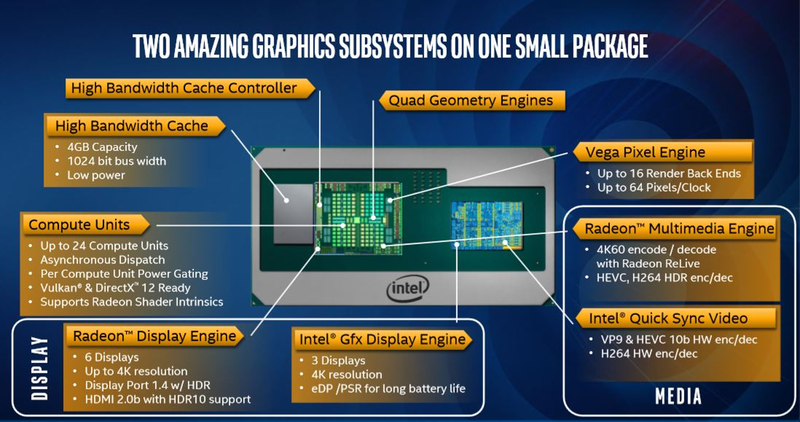 Since a picture is worth a thousand words, we’ll just put the slide by Intel which does a pretty good job at summarizing the two graphics solutions. On the surface, those new mobile gaming processors look really good and if all the parts do their job, this will be a great product. 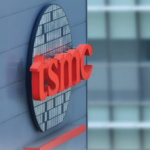 This is very interesting class of new gaming processors that really have the potential to take on a large market share that was previously owned exclusively by NVIDIA. What is still unknown is how well those parts will perform in practice and the price for those parts.